I should have included this motif in the last post, I did it to try Yarnplayer's Ocean deep HDT. It is always difficult to find the right motif to show the changing colours to their best advantage. 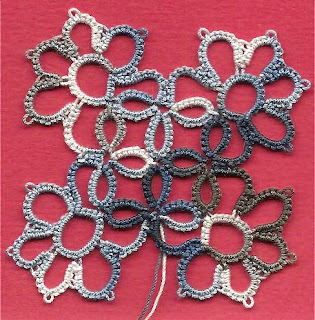 This is Masquerade from Mary Konior's book "Tatting with Visual Patterns". Then I returned to my comfort zone of size 80 thread, and did a snowflake from Jon's book. This one is Astral, done in Tatskool's indigo and Rainbow Bright. Yes, I do need to spend some time finishing the ends, I will, I promise! My final offering is Heart's Desire by Susan Fuller which I had seen on Mike's blog and Pamela's, but I couldn't find the pattern. I at last found it on a side link chez Tatting Chic. Again Rainbow Bright, this time paired with another favourite thread, Rainforest, by LadyShuttleMaker. All three are so pretty! Unfortunately, tatting is on the back burner right now. I have a class to finish... one more three-page paper, and then I'm ready to submit! 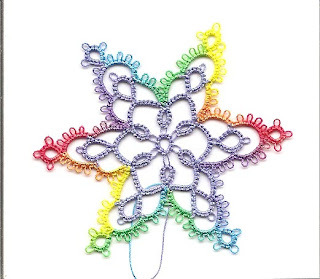 I will definitely take a tatting break! Hey, I am tatting as a form of procrastination, I am half way through an essay on human dissection and just can't get myself motivated! And so I tat... I hate myself! Lovely tatting, the threads look like silk. Good luck with your essay..sounds interesting to me. You have been busy Snowy! I love all of them and the heart is especially breath-taking! They all look great! You are so funny, "I will hide the ends, I promise!" LOL! You crack me up! I also hate hiding ends...I know I'm not alone in that, either. I am also cracking up by your comment to Diane...tatting as a form of procrastination...I can SO relate, LOL! Right now, I'm using tatting to cope. We're such "users" of tatting! LOL! 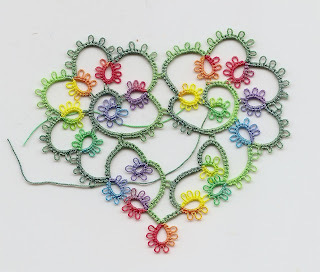 Your tatting is so lovely, especially in the hand-dyed threads. Glad you found the pattern for Heart's Desire by Susan Fuller. You can find a link to her pattern also on my tatting blog, Ambitatterous. It is also featured on my "mommy" blog, A Parently Speaking. A few years ago I combined "Hearts Desire" and Mark "Tatman" Myers' lovely fleur de lis design into a Fleur de Lis Heart. Of course I credited both original designers.